Today, I'm celebrating my second re-birthday from a bone-marrow transplant (BMT) that took place on January 11, 2013. If you're interested about my BMT journey, it's here. Thank you to my family, friends and my BMT medical team for all their help and support. Most of all, THANK YOU to my unrelated donor for giving me the gift of life. I'm a BMT nurse (at Duke, in Durham NC) and know from that experience the strength and stamina required of our patients. You deserve kudos, and you look great!!! Hello NC Sue, Thank you for visiting. BMT nurses ROCK! I love my nurses at the transplant center (Johns Hopkins). Thank you for all you do. Thank you, Loree. I always get excited when this day comes. It's a day of rebirth. Congratulations!!! Hoped you had a wonderful Holidays. Just got back from our Asian vacation and right now I'm walking around like a zombie in the house. Too jet lagged, dang! Hey, I'm so glad to hear from you. I bet you're jet lagged. I can't wait to see your photos. Rest for now. Thank you. Me too, Daphne. I'm excited about 2016. Congratulations on your second re-birthday! Followed here from image-in-ing's Wordless Wednesday on Tuesday. Hi Karen, Thank you and thank you for visiting. Hi Kayni! What can I say?! But to God be the Glory! I read your history I was thinking you've had ITP like my friend, but you've have had Aplastic Anemia instead. My aunt has had that but miraculously after she drank the tea of this plant we call "tawa tawa" here in my country daily, she's now well, she's just taking ferrous now as supplement. She used to be transfused up to 10 bags by the end of each month. By the way, this story of yours is a victory! You are very brave and inspiring! Kudos!! God bless! Thank you, Lei. 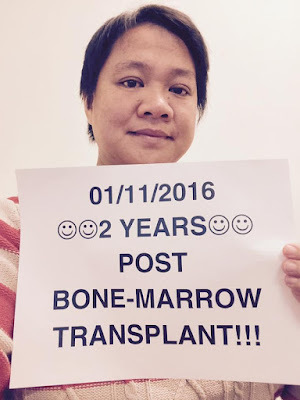 Mine started as ITP, then it progressed to Aplastic Anemia/MDS (pre-leukemia). I had to research about "tawa tawa" plant. This is a very interesting plant. I hope it gets into the global market. If I can only send you that. It just grows anywhere here, it is only a weed actually. It is being drank as tea for those who where afflicted here of Dengue fever which also makes the platelets low. Apparently most doctors doo not actually support this. But I believed because I knew one person where it worked. Congratulations on your long journey. So great to read success stories! Welcome back to blogging.